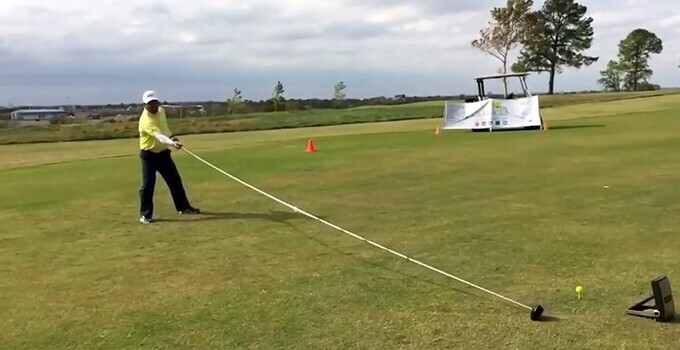 VIDEO: Could you swing a 20-foot, 6-inch golf club like this guy? Most people swing a golf club that's about 45 or 46 inches long. It's a stretch for most people to swing a 50-inch club, like long-driving champions do. So imagine how difficult it is to swing a golf club that's five times as long as your standard driver! Furrh held the record in 2012, setting the mark at the time with a club measuring 14 feet, 2.5 inches in length. That record has since been topped twice by different men in the space of a few months. How long Furrh will have the record this time is anyone's guess, but it probably won't be very long.